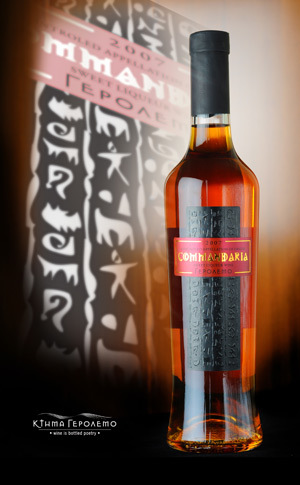 Commandaria (Greek: Κουμανδαρία) is an amber-coloured sweet dessert wine made in the Commandaria region of Cyprus. Commandaria is made from sun-dried grapes of the varieties Xynisteri and Mavro. While often a fortified wine, through its production method it often reaches high alcohol levels, around 15%, already before fortification. It represents an ancient wine style documented in Cyprus back to 800 BC and has the distinction of being the world’s oldest named wine still in production, with the name Commandaria dating back to the crusades in the 12th century.